There is a great conflagration happening in Canada as our national postal service makes changes to ensure its survival in an age when communicating by letter has become increasingly rare. The proliferation of social media, email, text messaging and all things electronic have decimated the business model of Canada Post, an institution that has been solid as a rock for a hundred years. Soon, home delivery service will be gone, phased out over the next five years, with the elimination of up to 8,000 jobs, though estimates are that that number could be in the 15,000 range. The business case for this dramatic move is pretty clear. The cost per address per year for door-to-door delivery is $269, with over 5 million currently getting this service. 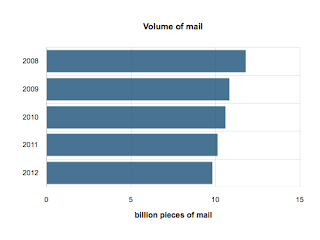 The cost per address for group mail box delivery is $117 per address. The writing has been on the wall for this gargantuan crown corporation for some time as yearly deficits continue to pile up and usage drops. We are also facing significant increases in the cost of mailing something. Stamps purchased in a package will go from the current price of 63 cents to 85 cents starting March 31st. Stamps purchased individually will be one dollar. I'm bucking the trend in terms of my relationship to snail mail. I've increased my use of the postal system in recent months, beginning a personal practice of sending people handwritten notes and cards of thanks. The discovery that I've made is that the message penetrates in a way that is entirely different than sending an email or text message. Kind words written out long-hand and delivered in an envelope, complete with an address and a stamp, are such a rarity that they resonate in a way that justifies both the time and expense. There is beauty in the symmetry of a letter that arrives in the mail, a composition containing the recipient and return addresses, and the majestic stamp on the upper right corner. Take the stamp away, and the magic fizzles. I had a letter ready to go to someone who works at Keyano, with no stamp, as all I really had to do was slip it right into their mail slot. I couldn't do it though. That envelope felt naked, unfinished, unfulfilled without that Robertson Davies stamp neatly tucked away in the upper right corner. There is also something very adventurous and interesting about releasing a letter into the postal system and imagining it going through a remarkable journey to get to its intended recipient. Released with intention, along the way, it picks up energy, momentum and a mysterious narrative of how it got from one place to the other. 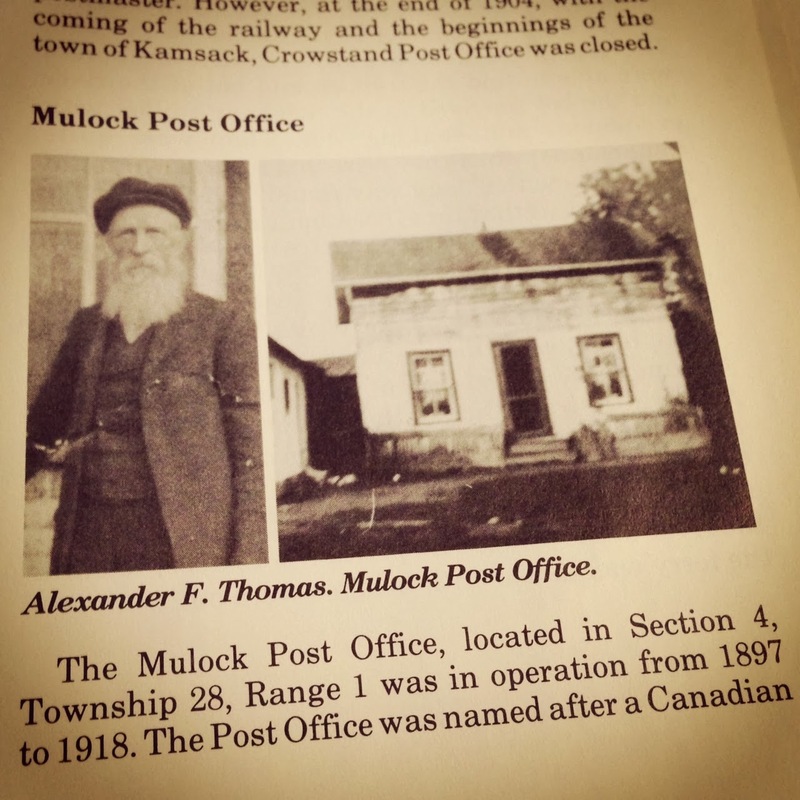 Think of the narrative that was created one hundred years ago when my great great grandfather, Alexander Fleming Thomas, ran the Mulock post office near Kamsack, Saskatchewan. In those days, much like in the television series we are watching right now, Downton Abbey, the mail was delivered by hand and horse. 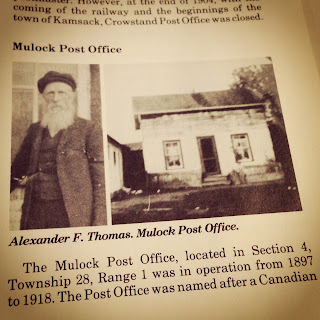 According to the Kamsack history book (Spinning Stories: A Woven History, 1988), Alexander's son Joe (my grandfather's uncle) "conveyed mail from Yorkton with a team of white horses famous in the district. About 1910 these horses were replaced by saddle horse." My good friend Steve Auty suggested on Facebook this morning that in being so active in social media, I am following in my great great grandfather's footsteps. "The Thomases: getting our country communicating since 1897," declared Aileen after seeing the posting. I had never made the connection between what I do in 2013 and what my grandfather's grandfather did a century ago, though the connection is absolutely there. Like Bob Dylan prognosticated and deeply felt in 1964, the times indeed are changing. Canada Post has had to make some decisions to move forward in a way that is more sustainable. Frankly, they should have begun adjusting years ago, though I understand the reticence to do so. I hope that one way or another that the letter survives technology. Perhaps the younger generation will discover the communication and connection magic of authentic handwritten words, contained in a little package, finished off with an interesting (though more expensive) stamp in the upper right corner.